Make Memories One Cool Science Experiment at a Time! 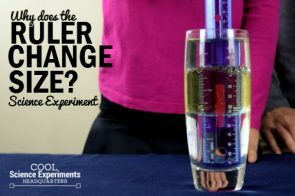 The purpose of Cool Science Experiments HQ is to provide a resource for those looking for fun science experiments. Science is so much fun and can be a wonderful way to create lasting memories with your friends and family. I enjoy sharing all the fun science experiments that we’ve done and hope that doing so inspires you to have some fun with science too! This will always be my top priority with this website. At the same time, I believe that it’s perfectly okay for me to be paid for the time and effort put into this website. I accept paid advertising in the sidebar and use affiliate links when they are available. That means that sometimes when you click on a link for a freebie, sign up for a great deal or download an ebook I may get a small percentage. Those things add up and allow me to support some of the costs associated with running the website. Thank you! That being said, my readers are my first priority, and the views expressed on this website are my own and are not affected by any compensation received. Thank you for visiting! 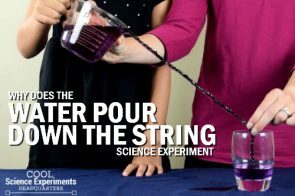 Why Does the Water Pour Down the String? Safety is a priority with every science experiment. Before conducting any of the experiments found on CoolScienceExperimentsHQ.com you must get an adults permission and help, follow the instructions provided as written and wear the appropriate safety gear (protective eye wear, clothing, etc). Have fun and stay safe! Copyright © 2019 Find Time for Fun LLC.